TIM DONNELLY STARTS EFFORT TO REPEAL VACCINATION BILL | "Global Possibilities"
A day after Governor Jerry Brown signed a tough vaccination bill into law, former assemblyman and gubernatorial candidate Tim Donnelly started an effort to repeal it. The new law aims to boost immunization rates by requiring that children be vaccinated to attend public or private daycare or school. The law eliminates exemptions based on personal beliefs and religion, while maintaining a medical exemption. Donnelly submitted his proposed referendum in a July 1 letter. He has 90 days from the date Brown signed the bill to circulate and file petitions. He will need to collect more than 365,000 valid signatures to qualify for the Nov. 2016 ballot. In a phone interview with KPCC, Donnelly, who’s now a radio host, said the new law is “devastating” to parents’ right to choose which medical care their children receive. “Why should the state have more control over our children’s health than we do?” he asked. When asked if he thinks he can collect enough signatures to get the issue on the ballot, Donnely replied, “we’ll see,” maintaining that there was a “huge outpouring” of bipartisan opposition to the bill. Donnelly’s is the first formal challenge of the law, but others are expected. 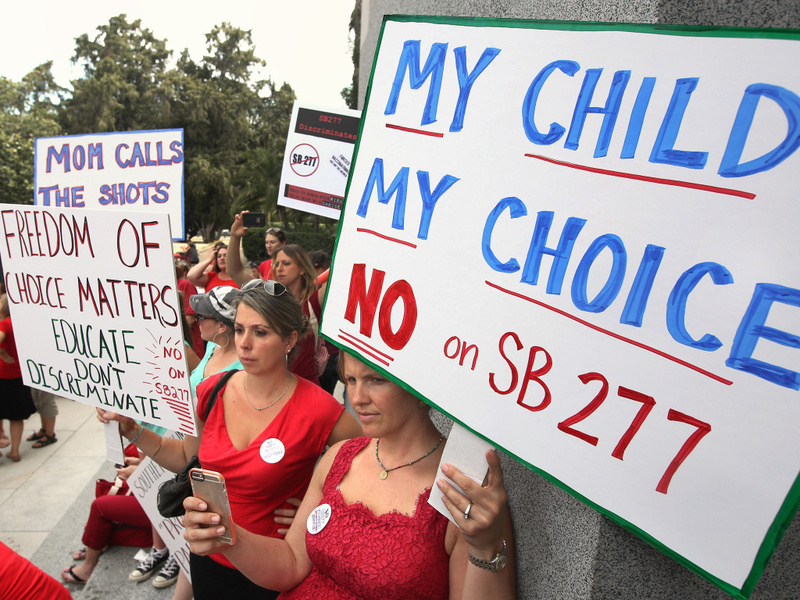 Christina Hildebrand, founder of A Voice for Choice, a group opposed to SB 277, said her group would also attempt to overturn the law through a ballot referendum. She also pledged to file a lawsuit on the grounds that the bill infringes on the state constitution’s guarantee of education. Sen. Richard Pan (D-Sacramento), who wrote SB 277 with Sen. Ben Allen (D-Santa Monica), responded to Donnelly’s move by issuing a statement asserting that Californians “overwhelmingly support” requiring vaccinations for school, according to a recent Public Policy Institute of California survey. “Our bill was a reasonable, science-based approach to protecting children, and the most vulnerable among us, from dangerous diseases,” he said. “I have spent my career campaigning to build healthier and safe communities and I will continue that work by fighting any referendum that hurts Californians,” added Pan. This story was updated on July 2, 2015 to reflect that Donnelly has 90 days from the date Gov. Brown signed SB 277 to circulate and file the referendum petitions.